Winding along the waterfront in Seattle, you never know what jewels you will accidentally discover. I met Vietnamese artist Hung Pham and his family while I was looking at this paintings along the sidewalk. The images of boats and water buffaloes reminded me of my travels in Vietnam. 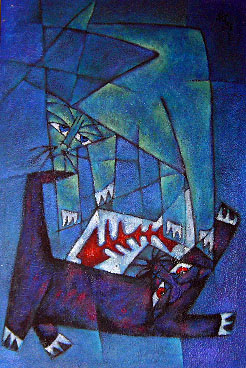 Among the spread of traditional pictures, my eye caught an abstract stunning painting of a woman and her cat. I immediately struck up a conversation with Pham and his wife with the best of many limited Vietnamese language skills. They told me their house was filled with more work similar to that, but the pieces were too large to display along the waterfront. One month later, I happily noticed that Pham's brilliant artwork was recognized by Seattle Central Community College Gallery Director Ken Matsudaira. On display until Aug. 16, the M. Rosetta Hunter Art Gallery located in the main building of SCCC presents Pham's pieces as a U.S. debut in a special exhibit. Normally on hiatus for the summer, Matsudaira wanted to experiment with having a gallery show during this time. Fortunately for Pham, the spontaneous exhibit enables the artist to display his work for a longer-than-average time length. The exhibit is a must see, for Pham's vibrant use of colors can only be fully absorbed in person. Pham says that when he was a student, his teacher in Vietnam commented on his talent for combining colors. Of particular note are his paintings titled "Old Town" that uses beautiful purples and "The Town Corner" mixing reds and yellows. Pham's acrylic paintings evoke a strong sense of village and home life, from which he draws inspiration. His body of work provides us with joyous glimpses of traditional life, celebrations, and labor ????. This includes pieces on Vietnamese market scene, or girl playing the Vietnamese instrument "dan tranh" and a group of women playing cards. Commenting on Pham's dramatic differing styles of traditional and modern techniques, he said through a translator, "In school in Vietnam, they teach you tradition and how to keep Vietnamese tradition in your work. They also teach Western techniques. When I show my work to audiences, I want them to be Vietnamese and particular to Vietnam". At first it was hard to follow the teacher, Pham said. "I tried to wrap everything in one. In process of studying Western and Eastern techniques, I created my own way of painting." Trained at the Hue Fine Arts University in the historic kingdom of central Vietnam, Pham's work has been featured in the 1992 and 1995 National Exhibitions in Hanoi, Vietnam, the 1995 Vietnamese French Cultural Artistic Festival in Hue and Paris, and the 1996 Kuala Lumpur Group Painting Exhibition. Pham, who claims that he could not draw anything up until the twelfth grade, credits his passion for painting as the source of his success. To enter the art school in Hue, Pham was discouraged from the field of art by teachers and failed the admissions test three times before he was accepted. He cites his major influences as Van Gogh, for his heart, and Picasso, for his mental creative process. "When I paint, I have lots of ideas that pop up in my mind," Pham said. "In the morning I try to draw a straight line. In the evening, I may change the line to a curved one." This winter, Pham will return to Vietnam in order to process his first year in America and incorporate his feelings as an immigrant into a new body of work. "It's hard to understand and describe my art," Pham said. "It comes from the heart."